Update: $860,000! FL Senate: Moneybomb for Marco! This week, we marked the first anniversary of the Crist-Obama stimulus rally by achieving our goal of raising $1,000 for every $1 billion wasted by the stimulus plan. With your help and the support of Sen. Jim DeMint’s Senate Conservatives Fund, we raised more than $860,000 in just 10 days from 11,000 donors through the Stimulus Bomb. Together, we sent big government proponents like President Obama and Governor Crist a message that we cannot continue spending money we don’t have and that a return to limited government principles is what will make America strong and prosperous. With the primary still 6 months away, now more than ever we must promote conservative values and endure in our efforts. Charlie Crist has repeatedly declined requests from Marco for a debate of the issues and ideas most important to Floridians. This week, FOX News tried their luck by inviting both Marco and Crist to participate in a nationally televised debate on March 28th. Marco immediately accepted, while Crist remains undecided. On Wednesday, FreedomWorks PAC marked the one year anniversary of the Crist-Obama rally with their own rally, which featured Marco. You can watch a short excerpt of his speech here. This week, we also launched a new text messaging campaign. 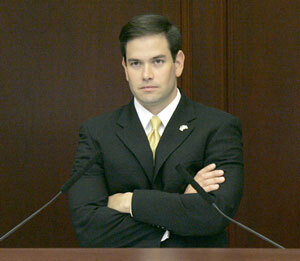 Don’t forget to sign up for updates on your mobile phone by texting MARCO to 69467. Update 3: 2/11- Results of the moneybomb to be released at noon EST today! Update: 9:21pm EST: WooHoo, we are almost there! $708k so far!!!! Sheer awesomeness! Update: 9:50am EST: I had a hard time getting through to make my donation, a great sign! Everyone please give what you can! Today’s the day! Please try to find some cha-ching for Marco, every bit counts. My $7.87 may not be much, but if enough Americans pitch in we can make a difference! And hey! It’s Time to Start the Countdown! February 10, 2010. Tags: Charlie Crist, Conservative Politics, deficit spending, Economy, Florida GOP politics, Florida Politics, Florida Senate Race, GOP Politics, Immigration, Marco Rubio, Marco Rubio addresses Freedom Forum, Marco Rubio moneybomb, moderate Democrats, National Security, Tea Party Patriots. Education, Foreclosures, Obama Administration, Politics, Popular Culture, Talk Radio, TARP, Taxes, Terrorism, Unemployment Statistics. Comments off. January 12, 2010. Tags: Charlie Crist, Economy, FL Senate Race, Florida Senate Race, GOP Politics, Kudlow Rubio interview, Marco Rubio, Tea Party Patriots. Obama Administration, Politics, Popular Culture. Comments off.